According to the team, Philadelphia 76ers' president of basketball operations and general manager Bryan Colangelo resigned today following an investigation into a number of anonymous Twitter accounts allegedly linked to the team executive. The allegations surrounding the five 'burner' accounts were first reported by the sports website The Ringer. Tweets from the accounts criticized current Sixers Joel Embiid and Markelle Fultz, former Sixers general manager Sam Hinkie, Toronto Raptors executive Masai Ujiri, and former Sixers Jahlil Okafor and Nerlens Noel. Colangelo admitted to using one of the accounts to monitor the NBA industry and current events, but never posted. He was not aware of the other four accounts. 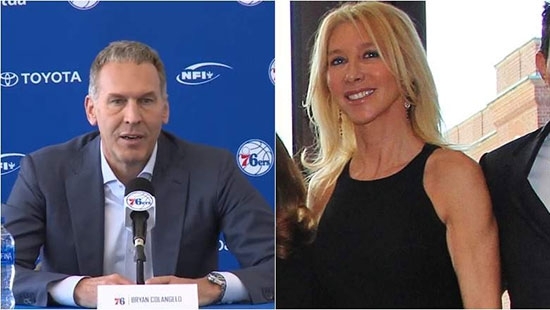 An independent investigation led by New York based law firm Paul, Weiss, Rifkind, Wharton & Garrison LLP determined that Colangelo's wife, Barbara Bottini, created those accounts and was the one who posted. "When interviewed, Ms. Bottini admitted establishing and operating the accounts. Forensic evidence corroborates her admissions," the law firm said. "Our investigation revealed substantial evidence that Mr. Colangelo was the source of sensitive, non-public, club-related information contained in certain posts to the Twitter accounts. We believe that Mr. Colangelo was careless and in some instances reckless in failing to properly safeguard sensitive, non-public, club-related information in communications with individuals outside the 76ers organization." 76ers managing partner Josh Harris said in a statement, "It has become clear Bryan’s relationship with our team and his ability to lead the 76ers moving forward has been compromised." Bryan Colangelo released his own statement and disputed the law firm's findings that he was reckless. He also characterized his departure as a mutual decision to part ways as opposed to a resignation. Head coach Brett Brown will oversee basketball operations on an interim basis as they team starts the search for a new general manager. The Philadelphia 76ers organization has accepted the resignation of President of Basketball Operations Bryan Colangelo, effective immediately. We appreciate Bryan's many contributions during his time leading our basketball operations and thank him for the work he did in positioning the team for long-term success. An independent investigation by New York-based law firm Paul, Weiss, Rifkind, Wharton & Garrison LLP was conducted into certain anonymous social media accounts that posted information concerning the club, personnel, and related topics (a statement of the findings is attached). It has become clear Bryan's relationship with our team and his ability to lead the 76ers moving forward has been compromised. Recognizing the detrimental impact this matter had on the organization, Colangelo offered his resignation. We find the situation to be disappointing for our entire organization. We are determined to continue the tremendous progress we have made over the last two seasons in our quest to win an NBA Championship. As such, we have appointed head coach Brett Brown to oversee basketball operations on an interim basis to lead our efforts in this important offseason. He will work closely with the rest of our talented basketball operations department in preparing for the upcoming NBA Draft and thereafter until a new General Manager is found. The search for a new General Manager will commence immediately. While I am grateful that the independent investigation conducted by the 76ers has confirmed that I had no knowledge of or involvement in the Twitter activity conducted by my wife, I vigorously dispute the allegation that my conduct was in any way reckless. At no point did I ever purposefully or directly share any sensitive, non-public, club-related information with her. Her actions were a seriously misguided effort to publicly defend and support me, and while I recognize how inappropriate these actions were, she acted independently and without my knowledge or consent. Further, the content she shared was filled with inaccuracies and conjecture which in no way represent my own views or opinions. While this was obviously a mistake, we are a family and we will work through this together. Although I am not directly responsible for the actions, I regret this incident occurred and understand that it has become a distraction for the team. Therefore, the organization and I have mutually agreed to part ways. Over the last two years, I have worked hard to help build a foundation for what I hope will soon be many championship seasons for the 76ers. I am grateful to team owners Josh Harris and David Blitzer for the opportunity they gave me to be part of such a great organization. I am saddened to have to leave under these circumstances. Basketball has been a core part of my life since childhood. I love the game and all those who play and coach it. I want to thank the many colleagues, players and friends from around the League and elsewhere who have expressed their support and encouragement during this difficult and painful time for me and my family. Paul, Weiss, RifIcind, Wharton & Garrison LLP was engaged by the ownership of the Philadelphia 76ers to conduct an investigation of issues arising from the publication of an article on May 29 identifying certain anonymous Twitter accounts that posted information concerning the club, its personnel and related topics. The article reported that the Twitter accounts may be connected in some way to Bryan Colangelo, the club's President of Basketball Operations. We commenced our investigation on May 30 and it substantially concluded on June 5. With the assistance of expert forensic consultants, we collected extensive electronic evidence consisting of multiple electronic devices (iPhones, iPads and other computer devices from multiple sources); conducted an extensive review of the contents of those devices, including text messages and other data; accessed numerous email accounts and reviewed the contents of those accounts; examined the account history of certain of the Twitter accounts; conducted witness interviews and undertook additional investigative tasks. The investigation was led by Brad S. Karp, the Chairman of Paul, Weiss, Lorin L. Reisner, a Paul, Weiss senior partner and former Chief of the Criminal Division of the U.S. Attorney's Office for the Southern District of New York, and Richard C. Tarlowe, a Paul, Weiss partner and former Chief of the Cybercrime Unit of the U.S. Attorney's Office for the Southern District of New York. The account names of the Twitter accounts under investigation are: Eric jr, Still Balling, Enoughunkownsources, and HonestAbe. We investigated the following issues, among others: (1) who was responsible for establishing the Twitter accounts or posting messages on those accounts; (2) whether Mr. Colangelo was aware of the Twitter accounts before May 22, when there was a press inquiry concerning one of the subject accounts; and (3) whether Mr. Colangelo was the source of any sensitive, non-public information concerning the 76ers or its personnel communicated on the Twitter accounts. As a result of our investigation, we do not believe that Mr. Colangelo established the Twitter accounts or posted content on those accounts. The evidence supports the conclusion that Ms. Barbara Bottini, Mr. Colangelo's wife, established the Twitter accounts and posted content on those accounts. When interviewed, Ms. Bottini admitted establishing and operating the accounts. Forensic evidence corroborates her admissions. We cannot conclude that Mr. Colangelo was aware of the Twitter accounts prior to the May 22 press inquiry. Mr. Colangelo denies any such awareness and we have not observed any forensic evidence establishing that he had knowledge of the Twitter accounts prior to that date. We note, however, that our investigation was limited and impeded by certain actions taken by Ms. Bottini, including her decision to delete the contents of her iPhone by executing a factory reset of the device prior to surrendering it for forensic review.